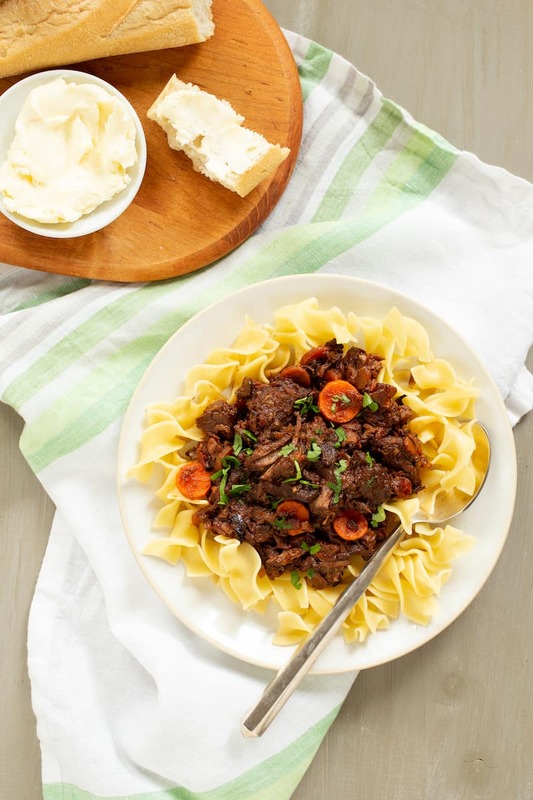 Boeuf en Daube (Beef Stew) Recipe from To the Lighthouse | Good. Food. Stories. “An exquisite scent of olives and oil and juice rose from the great brown dish as Marthe, with a little flourish, took the cover off. The cook had spent three days over that dish. And she must take great care, Mrs. Ramsay thought, diving into the soft mass, to choose a specially tender piece for William Bankes. And she peered into the dish, with its shiny walls and its confusion of savoury brown and yellow meats, and its bay leaves and its wine, and thought, This will celebrate the occasion . . .” (100). It is a recipe, Mrs. Ramsay explains, from her French grandmother. 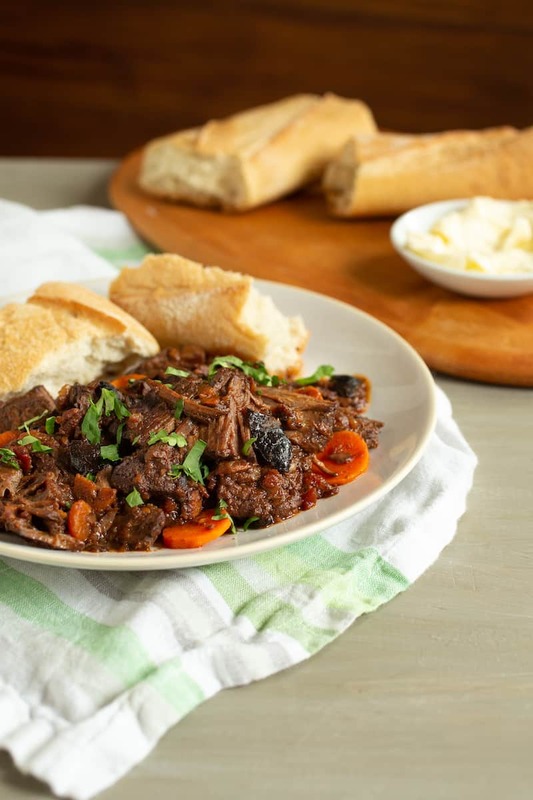 Daube is a Provençal stew that gets its name from the daubière (the terra cotta pot) it is cooked in, which doesn’t allow for evaporation of the cooking liquid, since the stew is traditionally made with less tender cuts of meat. Both are modernist works that are noted for their use of stream of consciousness, though where Proust’s madeleines trigger a waterfall of sensation and memory, Woolf is more likely to scatter tiny bombs of culinary deliciousness throughout her works. The extended scene of guests enjoying boeuf en daube in To the Lighthouse, then, is unusual in Woolf’s work, despite her clear fondness for description in general. Still, though she is often remembered as rather severe and ascetic, she is also the woman who penned the line immortalized in many a sampler and pseudo-literary serving platter, “One cannot think well, love well, sleep well, if one has not dined well” (A Room of One’s Own, 18). To the Lighthouse is a book about vision: visions of the past, perception of the present, artistic visions. And, clearly, culinary vision, because this stew is freaking delicious. 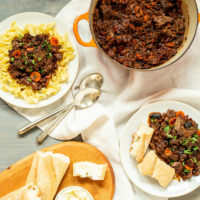 Some recipes (Julia Child’s, for example) scent boeuf en daube with cinnamon, orange, and cloves, but I prefer a more Provençal flavor signature, with olives and capers, and I add bacon and brandy to give it a mellow smokiness. Mildred, Mrs. Ramsay’s cook, spent three days preparing her boeuf en daube. Don’t worry; mine doesn’t take nearly as long. Mrs. Ramsay (clearly not a fan of leftovers) says, “Everything depended upon things being served up the precise moment they were ready” (80). 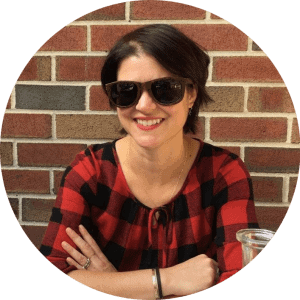 To the contrary, this stew is equally delicious the next day, cold or reheated. It can be served over noodles, with potatoes or other starch, or in a bowl on its own with crusty bread and salted butter on the side. Mmm, y’all, “I have had my vision” for sure (209). Recreate the famous boeuf en daube recipe from Virginia Woolf's To the Lighthouse with this savory beef stew. Place the beef, olive oil, and half the minced garlic in a sealable gallon-size plastic bag. Marinate at room temperature for 30 minutes to an hour (or overnight in the refrigerator). While the beef is marinating, you can prep your veg. In a large, heavy-bottomed pot such as a Dutch oven, cook the bacon over medium heat until crispy. Spoon out the bacon and reserve, but leave the fat in the pan. In batches, add the marinated beef to the pan and cook for about five minutes, turning the meat so all sides are browned but not burning your garlic. Transfer the cooked beef and garlic to a bowl. Add the onion, carrots, mushrooms, olives, capers, and remaining garlic to the Dutch oven. Cook for 8-10 minutes, stirring frequently, until the vegetables are soft. Add the tomatoes, wine, broth, and brandy to the Dutch oven and bring to a simmer, scraping up all the yummy browned bits. Return the beef and bacon to the Dutch oven. Add the thyme, bay, parsley, and peppercorns to the Dutch oven. If you don’t like them floating around in there, you can make a bouquet garni by wrapping them in cheesecloth (or a coffee filter or empty tea bag), tying it closed with butcher’s twine. Cook in the oven for 3 hours, until the beef is so tender you can pull it apart into shreds with a fork. If you find your stew doesn’t have enough liquid once it’s done, add a bit more wine; if you have too much liquid, thicken it with a teaspoon of cornstarch that’s been whisked with a little water to make a slurry. Serve with noodles, bread, or your favorite comforting starch. 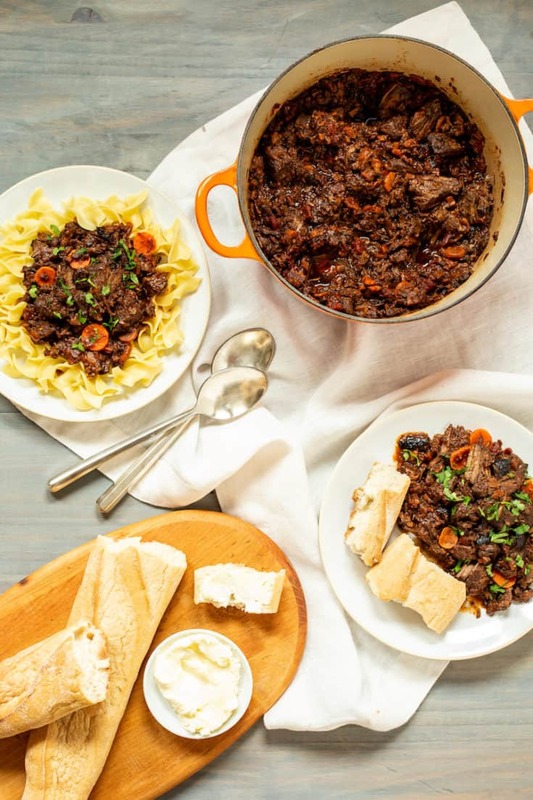 The boeuf en daube can be made up to 2 days in advance and refrigerated until ready to eat. Reheat over medium heat in a large lidded pot on the stove before serving.